Pastor Brian was born in Atlanta, Georgia but has called the Eastover area home since an early age. 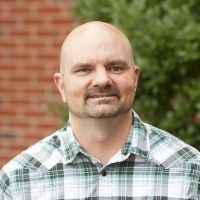 He is a graduate of Liberty Baptist Theological Seminary in Lynchburg, VA, where he earned a Master of Arts in Religion in Church Ministries. He continues to enjoy watching God transform the lives of children, teenagers and their families since he began working with them in 2001. Pastor Brian is married to his beautiful wife and junior-high sweetheart, Sarah. They are blessed with two wonderful children, Aidan and Allie.